Honda, you used to be one of my favorite automakers in the world. In a world of boring Toyotas, you were an exciting alternative. But somewhere in the last decade you forgot all of that. It makes me sad, and Honda, you're better than that. You've always had beige in the fleet, but that was balanced out with some excellent performance rides. There were cars from Honda that I used to lust after. The CRX was one of the greatest little hot hatches to ever hit the street. The Civic Si continued that tradition in a larger, more user friendly package. I actually wanted a 1999 Civic Si more than a girlfriend in high school. 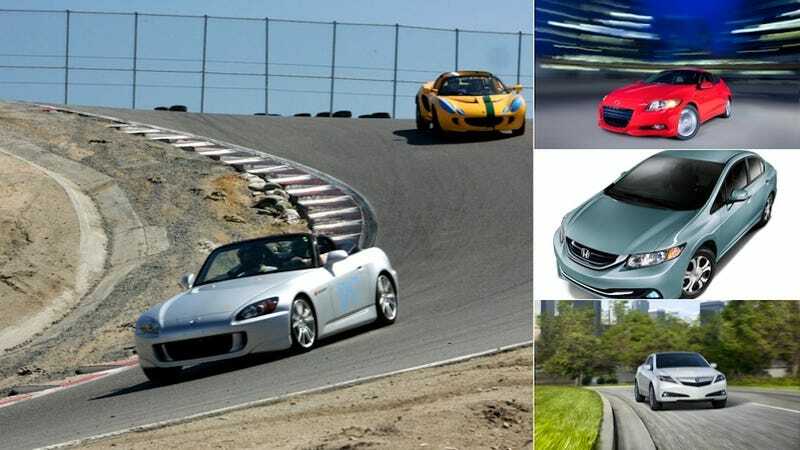 The S2000 was a modern update of Honda's classic sports car tradition. Acura was cool, too. The Integra brought premium and economical performance chops to the brand. I still consider the NSX one of the finest and sexiest cars to ever be built. You guys carved out your own niches in the economy and luxury game. Honda had cars that were inexpensive but still fun to drive. Acura was kind of a Japanese BMW for boy racers. Those identities worked. Then, for some reason, you made Hondas and Acuras boring. The Civic Si is now a fairly large and expensive car. The S2000 is long gone. The CRX's spiritual successor, the CR-Z, is a heavy hybrid hatchback. Acura got rid of the Integra and its successor, the RSX. The NSX is long gone, to be replaced by a hybrid all-wheel drive supercar. Acuras got ugly and a lot less fun to drive. But Honda/Acura still does a lot of things very well. Most of their interiors are very nice (forgetting the 2012 Civic debacle). They have some great engines, the 2.4 in the Civic Si/ILX comes to mind. There are slick gearboxes. I want Honda/Acura to be great again, and this weekend I came up with a few ideas on how they can get back on the right track. Honda, you need to build a performance coupe. A rear-wheel drive performance coupe. If you can find a way to throw in the 2.4 liter four banger from the Si/ILX in there, you'll have a winner. It's got a good bit of grunt, sounds fantastic, and loves to rev. Mate that to one of your excellent six speed manuals, and you have a winning car. It isn't the most original idea, but I believe you can make something that is at least as good as an FR-S/BRZ. A non-hybrid CR-Z also needs to make an appearance. Hey, why not put the 2.4 under the hood there too? The CR-Z would suddenly be lighter, faster, and I bet it would sell. A lot. Also, be a little more daring with your styling. Honda's of late have evolved slower than the Porsche 911 and have even been copycats — I'm talking to you, rear-end designer of the new Accord that spent a lot of time looking at the Hyundai Genesis. Acura needs its identity back. Give the cars real names. Integra, Legend, Vigor... those are names. Infiniti's new "Q" naming scheme at least means something. ILX, TSX, RLX, TL... that means squat. In a way, Acura is Honda's Lincoln. Both companies once had solid identities. Now neither company does. They have weird styling cues at the front end, and many of their cars are just fancied up versions of cars from their parent companies. Just because other brands have a signature grille doesn't mean you have to. Get rid of that stupid beak and get back to what you were doing so well: A couple premium front drive performance cars, a mid-engined supercar (you're almost there on this one), and a larger lux sedan with a good bit of tech (yes, I loved the original SH-AWD RL). Oh, and the MDX is pretty good, so keep making that too. Honda, you aren't Toyota. Acura, you aren't Lexus. You're you. Be you! You had solid identities and made great cars in the past, I'm confident you can do it again. Give me a call when your FR-S fighter comes out. I'll be first in line to buy one.